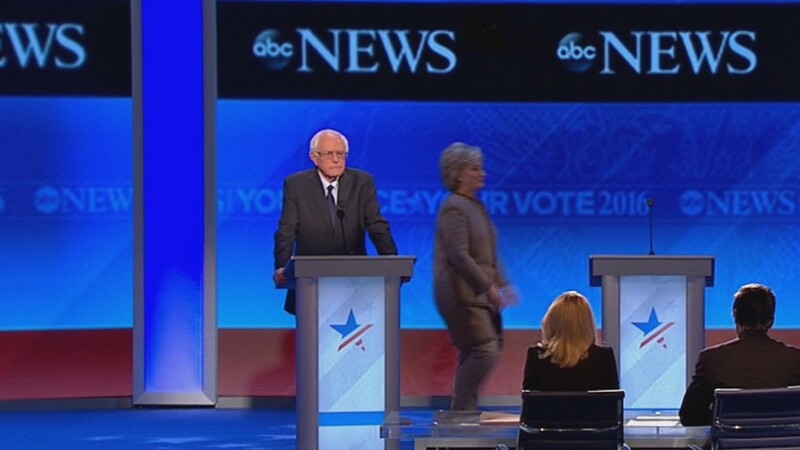 Halfway through the New Hampshire debate broadcast on ABC, the three Democratic candidates took the customary brief break midway through the program to make use of the venue's restrooms -- an exercise that most would concede takes slightly longer for women than men. But when the debate resumed, Hillary Clinton's podium stood empty. Despite the absence of the Democratic frontrunner, ABC moderators pressed ahead with questions. "We believe Secretary Clinton will be coming around the corner any minute," said moderator David Muir, launching into a query to Sen. Bernie Sanders about wage stagnation. As Muir continued the question, Clinton strode out to assume her spot at the center on the stage. The audience applauded. After a pause, Clinton shrugged. "Sorry," she said, prompting laughs. After a later pause in the action, Clinton was firmly installed behind her podium when ABC returned from commercial.